This summer our community has been studying the book of Job in the Old Testament. If you aren’t familiar with the book, Job is the guy who goes through intense and huge suffering. He is met with one disaster after another. He loses his ten children, livestock, health and property. Needless to say, he struggles to understand things, and his story raises the age old question – why does an all powerful and compassionate God allow suffering. The book is one of the wisdom books in the Bible, and Job’s poetically told story has a lot to teach. While at the lake in early July, we listened to an audible version of this book. A background of birds and gently lapping water was a stark contrast to the crisp and angry reading of Job’s complaints and his friends’ advice which only irritated Job further. (He called his friends “worthless physicians”). I found myself wondering when it would end! Despite the dark content, it has been a profound book to think about this summer in our Wednesday Bible studies. It occurred to me today how ironic it is that this book, so filled with tragedy, has been turning me toward gratitude. The message I have been encountering is that Job’s deep anguish was met by an even deeper consolation in God. It happened not through platitudes or even a literal answer to the question of why suffering exists. The consolation came through God appearing in the whirlwind, where Job was overwhelmed by God’s power. He had to admit that he knew very little in the face of God’s profound nature. C.S. 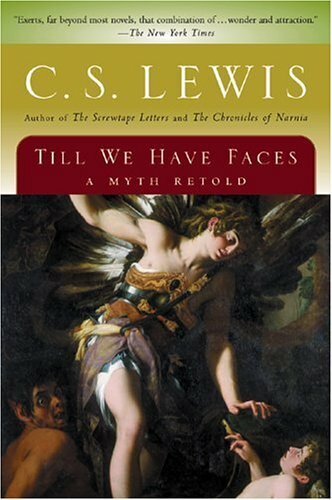 Lewis has a similar story in the book Till We Have Faces. Orual, the main character, has a lifetime of anger stored up against who she names as “the God of the Mountain”. Her complaints were recorded in a book that she carried around constantly and at one point she reads it in a rant against God. When she was finally finished spewing her anger, the huge book she had been carrying was left in her hands, but was now somehow just a tiny, tattered rag. Her suffering left her undone as she was caught up in the whirlwind. In the end, she was alone before the God of the Mountain who was much larger than she had known. What felt so huge became tattered and small. Like Job, she didn’t receive a literal answer. It was enough to realize that God was there, and was much larger than she had known. So how do Job and Orual’s experience bring me to gratitude? Reading Job, I was drawn in to Job’s angry complaints. They felt so justified. Whether personally or in situations in our troubled world, I think we have all felt hard done by at some point and wondered where God is in the mess. But as large as the anger is, God’s answer in the whirlwind felt even larger. 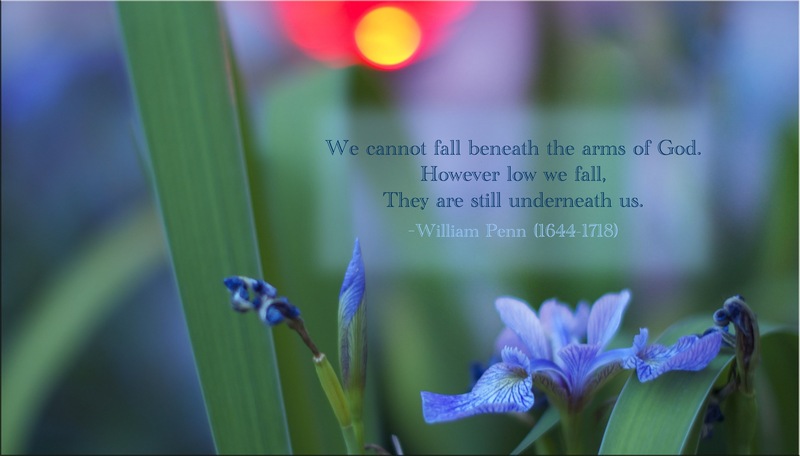 think of the prayer I came across a few weeks ago, as seen in this wonderful photo. Urged by a friend, I have been reminded lately to focus more on this deeper God. I am guilty, as Orual was, of carrying around my book of woes, such as they are. I have been reminded that God is so much more than I can understand, and I am brought to writing a book, or at least a list, of another kind – a list of gratitude. Thanksgiving is two months away, but it’s never too early to begin a list. “Dare to have joy” is what my blogging friend Mel call it, so here goes. The lovely hibiscus plant on my balcony which bursts out with at least 3 new flowers every day. My friend Marilyn who has been helping me set up my class. Dear friends who read and encourage my writing, listening to my deeper heart along with me. A full moon this last week which was so haunting and majestic. The enjoyment of the farm share we’re a part of this summer, which has included a weekly visit to a neighborhood farmer’s market. Every week, I love meeting people there and seeing all the bounty of summer. Turning against frantic school prep by going to the lake today! Having coffee with friends this summer – a friend I’ve known since childhood (thanks Charlotte), a student teacher turned friend (thanks Karen Cook), a sister (thanks Lorie), and my parents. Enjoying all the birds at the feeders and fountain in our backyard. Why can’t I get enough of them? Great books that have been such good company this summer. Wild, Acedia and Me, And the Mountains Echoed by the author of the Kite Runner, The Scent of Water. Being encouraged in so many ways to trust in the provision of God for the upcoming school year. My hope is to continue to write the list every day. I realized yesterday that I’m not praying for more blessings to occur. It’s more that the eyes of my heart need to become open more widely to seeing what is there in such abundance all the time.